The lube oil bottling equipment adopts PLC programmable control system and weighing feedback system to realize quantitative filling. Lube oil bottling equipment can feed and count the bottle, auto tare weighing automatically. This automatic lube oil bottling equipment always used for high request of measure, such a lube oil, daily chemical, chemical products and high extra value liquid weighing filling machine. The lubricant oil filling machine has high degree of automation, accurate measure. Each filling head has automatic wighting feedback system. Filling volume can be adjusted uniformly or individually to make sure measure are same.Whole machine manufactured according to GWP standard request, all joints uses easy joint ways, easy to disassemble and clean.Material contact surface used 316 stainless steel, other parts are all made of 304. King Machine is Manufacturer and Suppliers in China,and specialized in providing you with lube oil bottling equipment,lubricant filling machine,automatic lube oil filling machine and so on. Lube oil bottling equipment with stable performance, convenient operation, high cost performance. 2.Operation interface—-Two rows of the color operation interface, Convenient operation, stable and reliable. 5.Real-time alarm—-Automatic alarming when the fault happens, automatic stopping and alarming when the system appears serious breakdown. 5.Electrical elements—-Adopting international famous brand to ensure the remarkable quality, stability and high precision. Machine elements—-The parts contacted with the material use the 316 high-quality stainless steel and non-poisonous, anti-corrosive PTEF hose. Other machine parts use the 304 high-class stainless steel. 7.Counting detection—-Real- time counting, reflecting the output directly. 8.Filling detection—-No-bottle no-filling, it will not conduct filling if the bottles are not enough. 9.Function upgrading—We have designed intelligent weighing feedback system to realize the unmanned debugging function. 12.Maintenance condition—-Fully accords to the GMP requirements, easy to disassemble and clean. 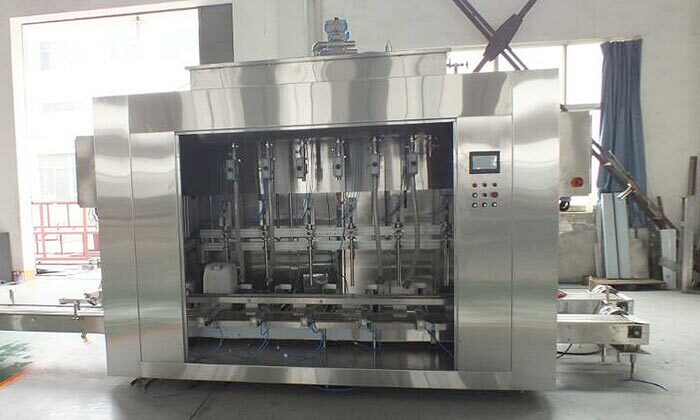 13.Changing specification–According to the changing of market specifications 5L 20L large-dose packaging range, only in the same machine operation. To save the equipment cost for the customer. when changing filling specifications, just adjust, no need to change any components. easily done.